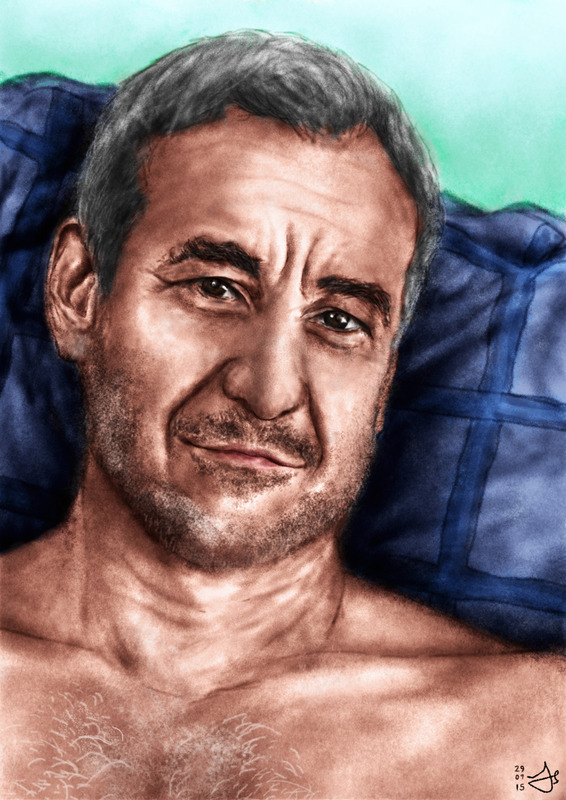 It’s been verging on a month since I indulged in drawing David Pevsner. What am I playing at…? David recently uploaded this stunning photograph to his (NSFW!) blog, and I had to have a go at it, for it might be my favourite one. It’s effortless, adorable and alluring. 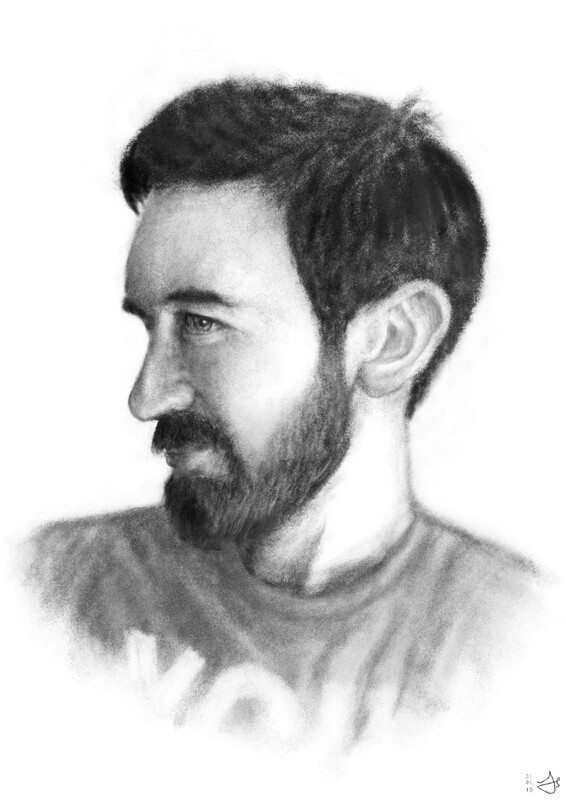 My drawing is slightly less so, however, as I don’t think I captured the smile and inviting eyes as much as I would have liked – he looks a little stern here compared to the photo. That said, I’m still quite pleased with the outcome – it looks like him, I think! I was tempted to forego the extra elements until some point mid-way through, where I decided that it’d be fun to try and capture the folds in the pillow, and also to try and make it actually look as if David is laying against it. I was wrong in assuming that would be fun – jolly frustrating it was, and incredibly time-consuming. I still can’t decide if the shading works or if it just looks as if he’s standing in front of an elaborate backdrop. I did a colour version too for you lucky people, thanks to Photoshop magic. It does add something I can’t quite put my finger on, but, as is usual, I prefer the black-and-white; more of that sparkle to it. I do these now as much out of gratitude as pleasure, for David shared both of my previous efforts on his site and they seem to have gone down quite well on the Tumblr-verse, as well as bringing a tremendous number of viewers over to this very secluded corner of the interweb. Thank you, David, it’s so very much appreciated! That’s it, then… until I succumb to the temptation once more, I suppose. How I laughed when I touted the idea of a spinning wheel to determine the time limit for my Reddit Gets Drawn practice runs. What a ridiculous suggestion. Um, yeah, you didn’t realise that, behind the laughter, I was being deadly serious… or I just turned to this in a fit of boredom and burgeoning flu. You decide. 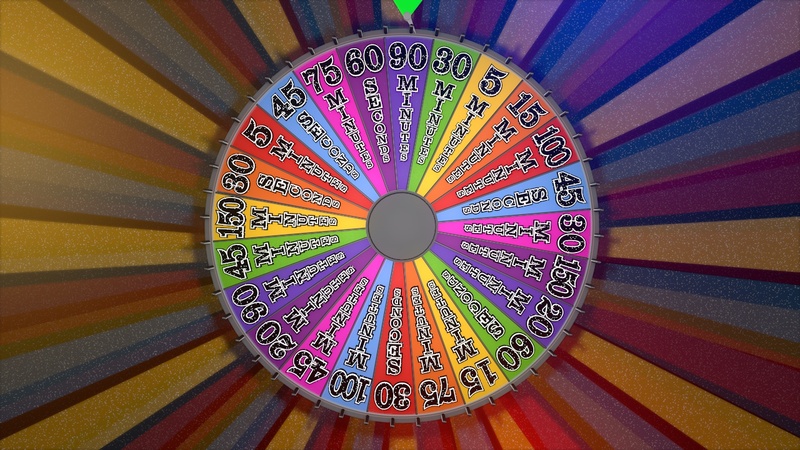 I have basically taken to Cinema 4D and refaced the wheel from our version of Wheel of Fortune, just to inject extra fun. Wasn’t that a wonderful show? Or not. But that satisfying ‘ping’ every time a contestant guessed a letter that was in the puzzle, and the adorably cheesy models flashing the prizes… ahh, the nostalgia. As you can see, there are some beastly spaces on that wheel, which I’m sincerely hoping it doesn’t land on anytime soon. I think if I pick any of the shortest ones I might have to ditch the Reddit element and work on self portraits – it’s okay to offend myself, I’d rather not do it to others! The most exciting thing on this – besides the generous helping of glitter on the type – is that the little flipper you see actually reacts to handles of the wheel, with some magic from connector dynamics. It took a great deal of time to create, and it’s a small reward in stature, but a pleasurable one when it works. In fact, I think this blasted wheel took longer to rejig than most of the values on it put together! Oh well. It’s learning. Learning is good. I had a wheel of a time. 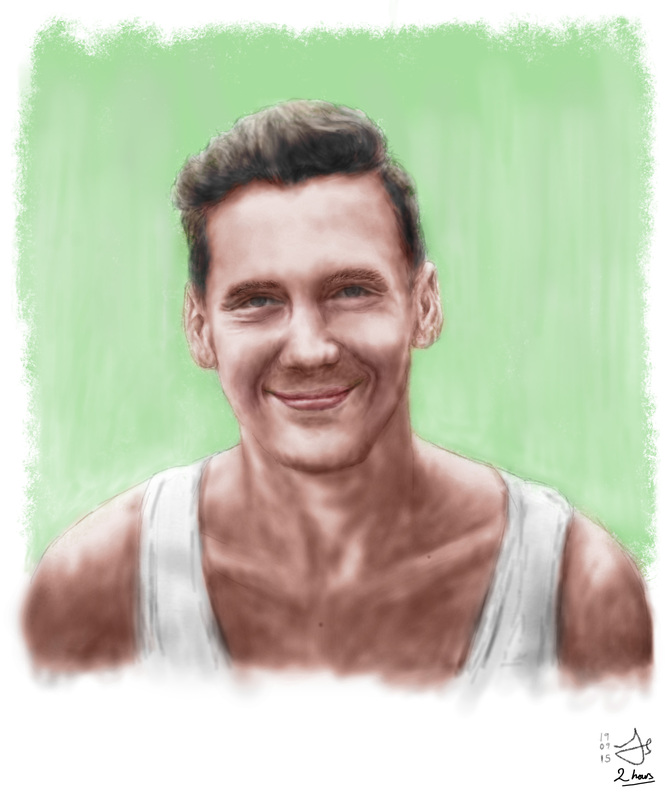 Welcome once again to S-Reddit Saturday, wherein I horrendously offend kind artistic volunteers of Reddit Gets Drawn in the name of creative practice. This week I took the time limit to scary new levels as I slashed two hours down to just one. As I said last week, I’m doing this simply to try and speed up; I’m not so much concerned about working slowly, I just yearn to become more efficient more quickly. To make progress. That’s what we’re here for, after all. I really liked the bubbly nature of this photo and thought it’d make a cracking portrait, though I was unsure of how it was going to go under rigorous time pressure. I had a desire to go for more of a pop style, such is her look, but again, under the clock I felt it best to stick to what I know on this occasion. Goodness, it was a bit of a frightening prospect when that sixty-minute clock started ticking. I was quite certainly peeing myself, to borrow a phrase from a fellow blogger, and indeed you might be able to tell as much from the poor initial outlines. It actually seemed to generally pass slower than I had convinced myself it would. This being said, it did become a bit of a frantic episode toward the end of time, and I had to completely forget about colouring – which is irritating, as it was something I really wanted to do with this portrait! – because the time was up before I even came to it; as you can see, I was still somewhere in the process of applying shading and tidying up scruffy marks as the clock – or rather, a sixty-minute selection of Carpenters and Queen tracks – finished. Not great, and I’m not sure if I’m cruel enough to share this with the subject on Reddit, but nevertheless a bit of fun and an invigorating challenge. I’m now off to change my underwear, wide-eyed in the thought that I’m likely to push myself even further next week. What will it be… forty-five minutes? Half an hour? Even less…? 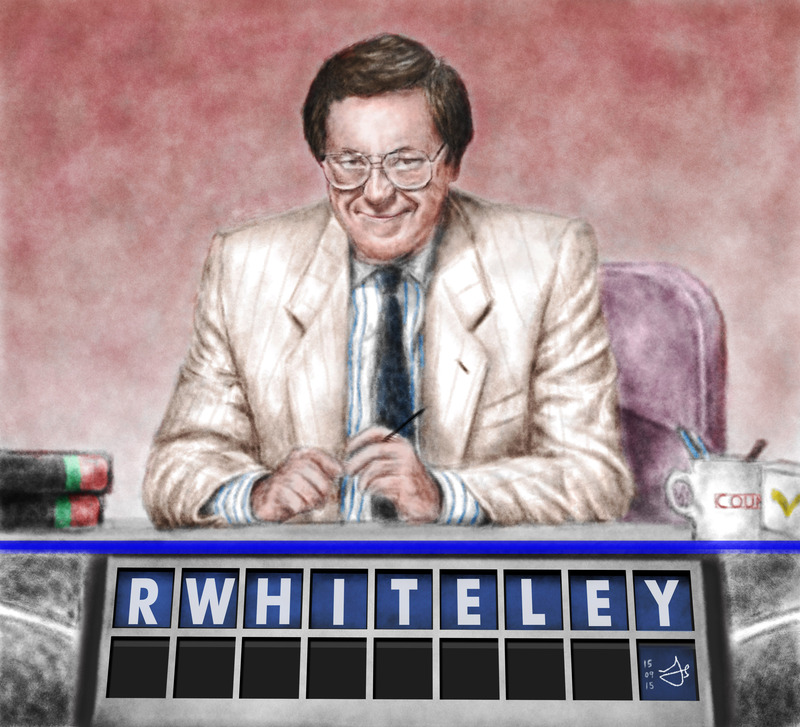 Perhaps I should have a tombola drum to draw from, or a wheel to spin… there’s an idea! Another Saturday, and another voyage into the unknown as I get a little further acquainted with the brave new world, Reddit, moreover Reddit Gets Drawn. I like the idea of fashioning it to become the basis of a weekly challenge of sorts, although knowing me now I’ve said that I’ll probably never go there again… I’ll try me best! I’ve always been slightly curious of just how long it seems to take me to make a half-decent portrait, even though I know that ultimately matters very little. But seeing others knock superior stuff out in sometimes under ninety minutes, I just like the idea of someday being that efficient. On that vein, I’ve begun using these images to pit my wits against the clock – this was done under a firm two-hour limit. 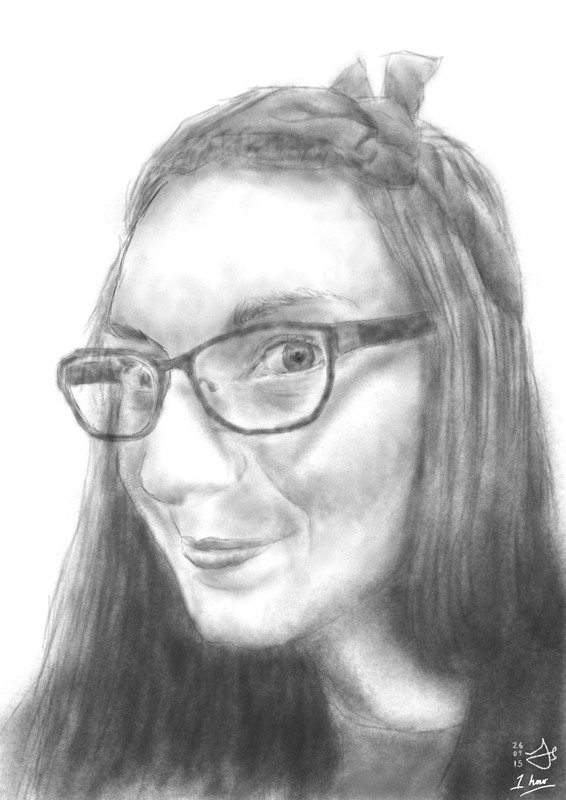 It probably shows, considering most of my other portraits unless otherwise mentioned generally consume more than double that, if not even longer. 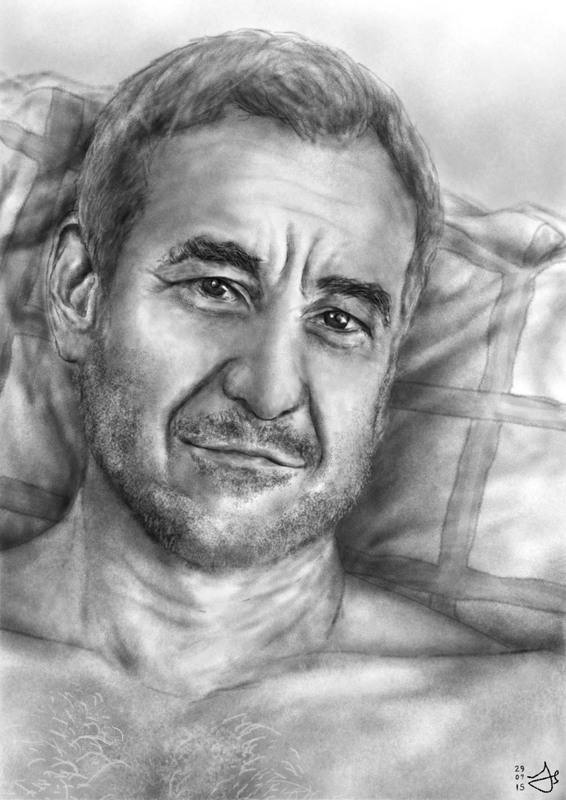 Our voluntary subject looks a good few years older than I’d estimate he is going by the photograph, thanks to the shading being very, um, shady in places – such smooth skin, and yet so apparently hard to render! I think it was a combination of going a little quicker than I needed with the time limit in mind, and generally having a touch of the ‘off day’ – I wouldn’t say I’m pleased with it, but I got more done than I thought I would. I realise now just how much of that work time is spent fiddling, tidying up and generally losing the will to live! Tick tock. The presence of the time limit was a bit of a perk as it encouraged me to not to get distracted, as I always do. Encroaching deadlines often have that effect, don’t they, much as fear them. If I’m feeling brave, maybe I’ll try 60 minutes next Saturday and see how I get on. The countdown starts now! This is, I believe, the first drawing I’ve uploaded to this space which hasn’t relied on a photograph or reference image in any way. This was created completely by the mind… there were supposedly limitless possibilities, and this is what came of it! I don’t know what that says to you about my imagination. 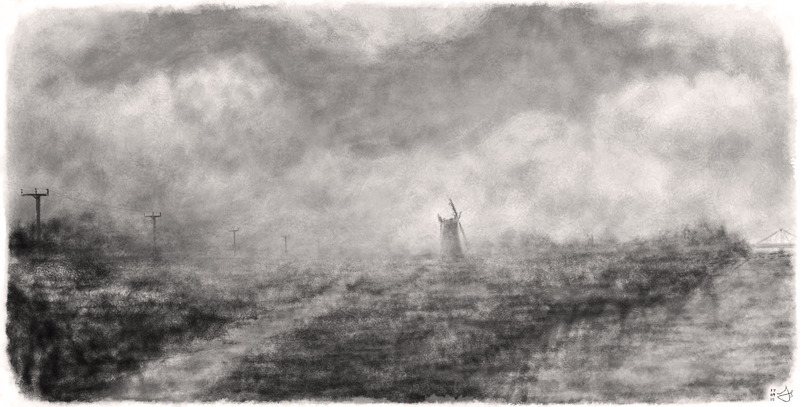 Well, I guess it begins to illustrate the thoughts of eeriness I mentioned a while ago when drawing Norton Marsh Drainage Mill, with what appears to be a hazy summer sky moving aside for a big-arse storm, just to make things extra scary… you don’t want to be out on the broads when a lightning storm hits, let me tell you from experience! As it happens, I used to dream up scenes much like this as a child, often inspired by Sundays out with my family, which invariably saw us out on the broadland somewhere (These were the days when, being Sunday, it meant there was little else to do!). Using only a pen and whatever paper I could get my hands on, my mother knew it kept me out of mischief, so she would buy me no end of sketch pads, old diaries, anything… I wasn’t much fussed… I’d be out of her hair for a few hours. She would do that a lot. I wonder if this ‘full circle’ of sorts has been spurred in any way by my recent return to walking. I’ve been out and about a lot over the past few months, indeed every single day since the start of August, as it’s widely reputed to be good for depression. It’ll do me the world of good, they all say. (And then I scream at hearing that tiresome bloody phrase on endless repeat.) I can’t say it’s had a massive impact in that respect – I probably got desperate and overestimated the effect it’d have – but I have found myself forcing myself to do it every day, so it must be doing something positive in there. I’m trying to increase my mileage with each week… maybe one day I’ll outstretch and bend time backward, to the pathways I explored as a youngster, which look a little like this one. Fittingly, I was working against the clock rather with this drawing – it’s a little swifter than normal, and I was concerned about the impetus of nostalgia hampering things, as it often can, but I think it went quite well. 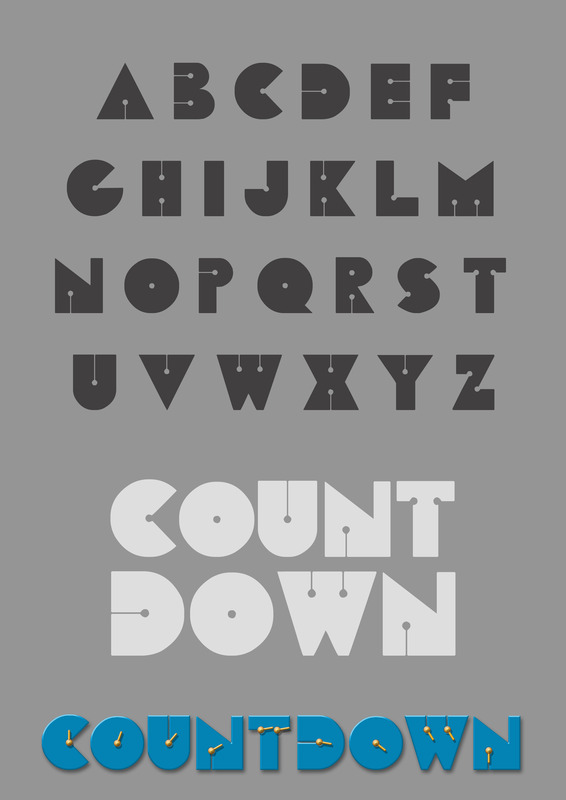 With much energy to expend, I also had a go at cutting a font inspired by the Countdown logotype used in the title sequence of these old shows, appreciating such things in ways I’m sure I did not as an infant. The visuals have inevitably not aged well, but as lettering, it’s a pretty funky display face… one I couldn’t pin down, so I made it! I should really do Carol Vorderman next, I suppose. Soon. I grumbled in only my previous post on the haunting prospect of the self-portrait. Well, this one’s actually been floating around for a couple of weeks and I haven’t had the balls to post it… until now, when it’s quiet! It has a pair of reasons behind its creation, actually, neither of which vanity: to test out a new custom pastel-esque brush I’d made in Photoshop, and second, to mourn the passing of my beard, which I removed shortly after the source picture was taken, for reasons I don’t really know. It had been there so long that I felt quite guilty and bereaved after the deed. Fear not! I am growing it back, for I quickly grew tired of looking like a haggard fifteen-year old. OK, maybe one of the motivations was vanity… but still, there we are. Indeed, there I am. Another mildly curious point of interest is the fact that I actually have neglected my glasses – with the angle, they (or rather, their reflections) were almost completely obscuring my left eye, and besides, they just weren’t working very well. Must try harder! There we are. There I.. oh, I’ve already said that. I DID A SELFIE and posted it. More of a gold star moment than you will ever be aware.